It is 30 years since the death of my beloved father who was killed by the LTTE on June 26th 1985. Many things have happened since then and I hope we can contemplate on the violent path taken by the LTTE and the unconditional support given by most of the Tamils to address their grievances against the Sri Lankan state. I wonder if we have a collective maturity as citizens of Sri Lanka (Tamils, Sinhalese, Muslims, Burghers and other minorities) and Sri Lankan Diaspora to learn the lessons from the violent path from both sides and what that has led us to. I am not going to dwell on the politics of the conflict but rather reflect on the legacy of my late father whom the LTTE portrayed as a ‘Traitor’ when they gunned him down. What they did not know and failed to realise was that many such people whom they killed loved the land and the people they served. They were not stooges of the Government of Sri Lanka (GOSL) or against the legitimate rights of the Tamil people but were doing their part in a very explosive political situation. Many of those who were killed both by the militants and the GOSL had opportunities to leave the country as many of us have done and seek greener pasture and safety. But they stayed put because of their conviction and dedication. The last time I saw my father was in December 1984 when he with my mother and brother came on a holiday to Bangalore. Two of my sisters Vasanthy & Jeyanthy and I were already in India. We booked a cottage at Vishranthi Nilayam in Bangalore and had an enjoyable family time. Sorna was the one missing as she was married and was living in British Guyana. Knowing the political situation I was making inquiries to get my father to relocate to a Mission school in Ootty When I mentioned this to him his response was firm. ‘I will live and die in Jaffna.’ When a Student Organisation organised a meeting to condemn the Standardisation Policy of the GOSL they approached Principals and Educationist to speak at the meeting. Many refused fearing they may be targeted by the GOSL. My father willingly agreed to speak in a public forum condemning the policy which he did. There is another incident that many may not know. When the youth resistance started in the late 70a and early 80s there were many groups that sprung up. A famous BBC reported visited Jaffna undercover to report on the ground situation and the political situation. He was keen to interview leaders of the resistance groups. But organising a meeting with the security tightened was impossible. When my father came to know of this he took the risk of organising the meeting at the Principal’s bungalow. Leaders of different groups came and met the reporter at the bungalow. That evening the reporter relayed the news to the BBC headquarters through the phone at the Principal’s bungalow. My father did not agree with the violent path taken by the youth. He knew where it would end. 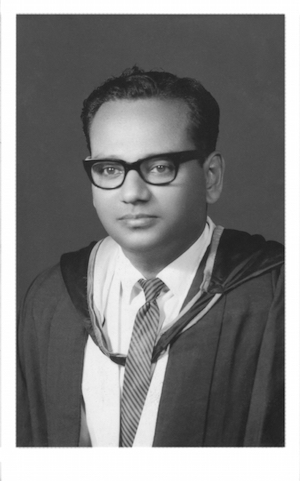 He wanted to safeguard especially the students of St. John’s College (SJC), Jaffna under his educational care from falling prey to the propaganda of the militants. He would never allow St John’s College to be a platform to promote the path of violence. It would be good to reflect on that wisdom. Once a militant group wanted to distribute pamphlets inside the school. He not only stopped it but engaged with the militants and told them in no uncertain terms that he was in charge at SJC and the day they came in against his orders he would get out of SJC. The militants respectfully left the place. My mother, my sisters and brother have had a time to reflect on how we have travelled the last 30 years. In the sharing there has been pain, tears and joy. Our pain is joined with the pain of all those who have lost their loved ones in this meaningless war no matter on which side of the politics they were. We have played politics with our pain for so long and that needs to stop. We need to humanise the pain so that we may reach across our divisiveness and hold hands to resolve that what we went through no human should go through again. Atleast resolve to do our part and not fall prey to the politics of divisiveness. The death of my father has also strengthened us in our resolve for justice and human rights and the non violent path of resistance. The brutal end of the war has signalled we need to break decisively with those failed policies of the LTTE as well as those of the Sri Lankan ruling elite and self-interested politicians who would not hesitate to plunder the country and divide its people for political and economic gain. Instead we must build a new and a bold movement that could unite all those who have been exploited, disadvantaged and marginalized. There is also a call to the Diaspora communities. The challenge to us is whether we can model a harmonious community of various ethnic and religious backgrounds of people of Sri Lankan origin and background in our adopted countries. This community can be a catalyst, a reference point offering an alternative to failed and missed opportunities for harmony in Sri Lanka. This community needs to be an open community where members will listen to each other, respect the opinions and views shared even though we may not fully agree with them but continue to dialogue and stand together affirming the goodness in each community. There also needs to be a strong commitment to Human Rights and Justice and Equality for all and not just for an interested ethnic group. We must also acknowledge that there is still so much of bitterness, hatred, suspicion and name calling between and within communities. We need leadership both at political, civic and religious levels from all communities that calls for a spirit of tolerance, acceptance and most importantly forgiveness so that the hatred and bitterness could be put to rest and genuine dialogue can begin in the spirit of understanding with a strong will to work towards justice, peace and harmony. The path will not be easy. But pursue it we must for the sake of our own humanity and our future generations so that the death of those who like my father and others who dreamed of a peaceful Sri Lanka will not be in vain.